Man today we hear a lot about living strong. Messages come at us everywhere from Kaiser Permanente commercials to shows where personal trainers beat the liver out of people to make them the “best they can be.” Yeah, buddy, I don’t think it is an exaggeration to state that strength often times is seen as a physical trait in our overly zealous “body beautiful is everything,” society. But not long ago I was introduced to a different kind of strength, one that takes effort to develop and maintain. It is called spiritual, emotional and mental fitness. I recently attended the funeral of a dear friend’s mother. During the luncheon, following the service, I stopped to greet a group of folks who attend a church Keith and I used to attend. One woman at the table looked at me and said, “I am so glad you are putting on weight. I mean you are not fat, dear, don’t get me wrong. I always thought you were just too skinny, and it is nice to see you packing on the pounds.” I hear a collective gasp from all the females out there. Right. Wow!! Who says things like that to anyone at any time, but especially in public? The other people at the table stared at her with their mouths open. Yet even in this sea of obvious communal offense, she continued to chatter on about my weight gain. Actually I still fit into my size 10 jeans, and as far as I know I am not tipping the scales more than usual (sorry just had to say that – vanity is a ceaseless nag). To say I was surprised by her lack of tack and class would be an understatement. To say she did not hurt and embarrass me and everyone else at the table, for that matter, would be an outright lie. I am going to admit right here that over the next couple of days, I spent more than a few sessions looking in the mirror at my now past 60-year-old body and wondering if I really do have a weight problem and just can’t see it. While thinking about this surprising public slap in the face, I asked myself why some people enjoy putting others down. I also acknowledged that a few years ago I would have come back with an insult and “put her in her place.” After all how dare she? But to tell the truth, I really didn’t feel a need to respond with another put down. Age and experience are teaching me that it would have made me feel no better and in fact would have made me feel worse. That puzzled me too because as some of you know, I can be quite formidable when it comes to verbal combat. I am my father’s daughter. Albert had a black belt in tongue. Sorry I digress. Then a few days ago a friend of mine, Carrie Obermeyer, put the saying on Facebook by Michael P. Watson, courtesy of quotediary.me, that accompanies this blog entry. It hit me between the eyes. This not only answers the questions I have about the put down artists in the world, it encourages me to honestly admit that I too can easily join their ranks. And it takes conscious exercising of good decision-making muscles to not do just that. Thank you my friend, Carrie. We have all heard it said, and it makes perfect sense, that folks who do not feel good about themselves need to direct those negative self feelings towards others to feel better personally, right? Sometimes they even have the bad taste to do it in a public format. Who hasn’t had this happen from time to time? 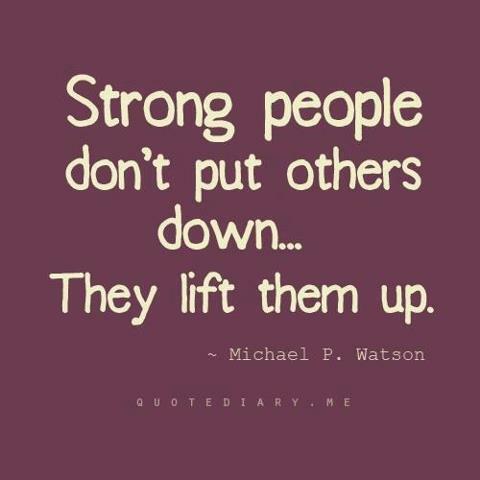 But to see putting others down as evident lack of personal strength just never occurred to me. And it challenged me to not only overlook this woman’s offense in my direction but to understand that by refusing to respond to her I was exercising some pretty serious emotional/mental weight lifting. Yes, one can change – oh hope abounds. Please don’t think that I am blowing my own horn here. My struggle to keep my mouth shut was intense. But today, in retrospect, I feel better about me. I know that I have no control over the behavior of this woman or anyone else in my life (including family members) when they are sarcastic, unkind or even unfair towards me. But I do have the opportunity, when those things happen, to truly rise above it and be the stronger person. Sounds a little silly to some out there, huh? Well, try it my friends. The next time someone makes a joke at your expense so they can look cool/funny or cleaver just look at them, smile (lips only) and change the subject. The next time someone aims an insult in your direction, even because they are just “kidding around,” or “clueless as to their being classless,” respond with silence. It doesn’t have to be a stony silence because that might also serve as a retaliatory put down. Then walk away, refuse to look in the mirror to see if in fact it is your problem and know in your heart that you are the stronger person. It just feels so good, can keep from escalating an unpleasant situation and helps you realize that in fact it is “their problem.” No kidding, it works, really. And the big payoff? Just like continued strengthening exercises for the body, the mind and emotions get stronger with every good choice to exercise strength. If there is a chronic verbal abuser in your world please be prepared to be accused of being too sensitive or having no sense of humor if you choose to ask them to please stop their hurtful behavior. Here is where we get stronger all the time. Posture yourself to do some heavy lifting by mentally recalling that a strong person does not need to make others feel weak. It is a reflection on them. And, really they are giving you opportunity to get stronger by refusing to engage in the dance of unkindness, whether they are intentional in their comments or not. Can I hear an Amen? Ah attitude of gratitude. Okay, okay I admit that sometimes this doesn’t work and we have to clean out our close circle a little or limit the amount of exposure to the hurtful units in our life. Truth be known, friends, there really are some just plain ole mean people out there or those who believe they have a right to make everyone else pay for their particular issues. It is equally true that some folks do not mean any harm and would be outraged at an attempt to make them see the harm they are doing. In those cases, where possible, it may be necessary to remove them from your life. I personally have had to do this. When all is said and done, that is one of the biggest exercises in mental/emotional and spiritual fitness I can think of. Basically it shakes out to a positive personal affirmation that says, “I don’t need to deal with this and I sure don’t want to resort to being like this.” Now that is living strong, baby, strong. Thanks again Miss Carrie. You are one of the strong spirits and uplifting people in my life, and I appreciate you, darling. Yes ma’am I truly appreciate you. Thank you, Laura! The meme you have included in this post came at the right time, when I was feeling frustrated and sad. I have actually just started laughing at the type of person you mention, because I realized that I don’t really care what other people think, except for my close friends and family. It’s so much better than being offended. And you, my dear friend and mentor, are absolutely beautiful, inside and out. I hope you know that! Thank You Carrie. To be called a friend is a great blessing. To be called a mentor is a blessing with great honor. Thank you again for the inspiration for this entry.